On Saturday, November 23rd, TheatreWorks New Milford provided an invited audience with a sneak peek of their forthcoming production of Ken Ludwig’s The Game’s Afoot. Following the preview, the beautifully appointed holiday-themed set served as a backdrop for various announcements from the Board at TheatreWorks. President Glenn Couture took the stage, thanking the audience for making TheatreWorks Connecticut Magazine’s 2014 winner for Best Community Theatre. He then acknowledged the passing of some of our community’s most beloved fixtures, including Jude Callirgos Robinson and Nancy Camp, both longtime friends of TheatreWorks. Couture then announced that the passing of one of TheatreWorks founding members, Hope Meinhardt, would be commemorated with the naming of the performance space as The Hope Meinhardt Memorial Auditorium. Board Member Jill Fay Pace then announced the upcoming children’s programs, including the two TWKids productions for 2015: Dear Edwina Jr. and Shrek Jr. Continuing the tradition of bringing lesser known or more complex pieces to the stage, Secretary Joseph Russo announced the Page2Stage selections for the next season, which include Tom Eyen’s Women Behind Bars, Terrence McNally’s Master Class, Israel Horovitz’s My Old Lady and the return of Jeff Goode’s The Eight: Reindeer Monologues, which was produced on the TheatreWorks stage in 1998. Russo also informed the audience that in the summer, TheatreWorks will be introducing a Workshop Series for Connecticut Playwrights. 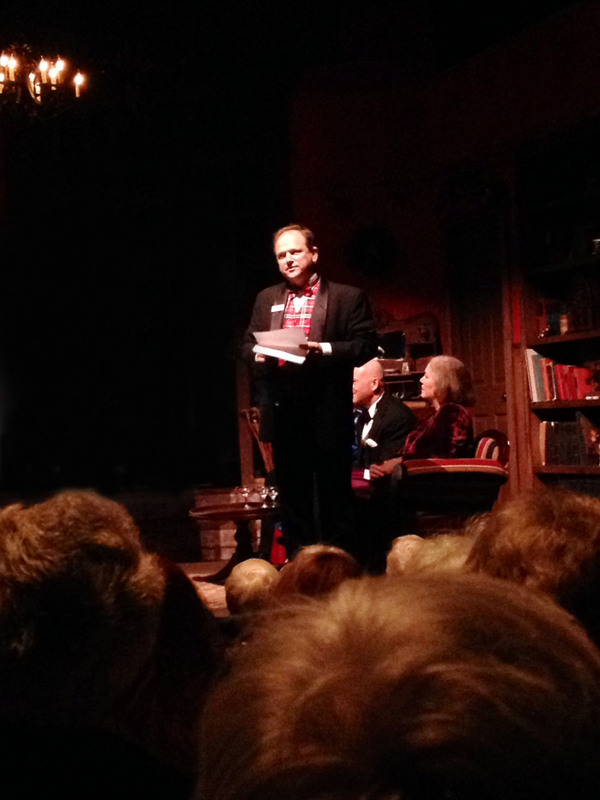 TheatreWorks President Glenn Couture announces the 2015 season. President Glenn Couture then announced the forthcoming productions that will be mounted by the theatre. Kicking off the season will be Nicky Lyon’s comedy/drama, The Lyons, directed by Matt Austin. The Lyons centers on the passing of patriarch Ben Lyons as his wife and children face the prospect of a future without him. The Lyons will open on February 20th and will run through March 13th. Priscilla Squiers will reprise the role of Florence Foster Jenkins in Stephen Temperley’s play two-character play Souvenir. Joined by pianist Greg Chrzczon, Squiers will portray the wealthy socialite whose fame was achieved through the performance of notoriously off-key recitals, including a sold-out recital at Carnegie Hall. Souvenir will open on May 1st and will run through May 23rd. Following Souvenir, Pulitzer Prize winner Donald Margulies’ Time Stands Still will take the stage under the direction of Sonnie Osborne. The play revolves around Sarah, a photojournalist injured in a roadside bombing in Iraq, and her reported boyfriend James as they navigate the emotional aftermath of an event that alters not only their relationship but the way they will live their life going forward. Time Stands Still will open on July 1st and will run through August 1st. In the fourth slot will be Ken Ludwig’s farce Leading Ladies about two down-on-their-luck Shakespearean actors who are looking to get a piece of an ailing woman multi-million dollar inheritance through whatever means necessary. Mistaken identity and unexpected twists will leave audiences rolling in the aisle. At this time, the director is to be determined. Leading Ladies will open on September 18th and will run through October 10th. The 2015 season will wrap up with a production of John Van Druten’s classic Bell, Book and Candle under the direction of Joseph Russo. The romantic comedy introduces us to Gillian Holroyd, a witch who casts a love spell on her unsuspecting neighbor, Shep Henderson. Bell, Book and Candle will open on December 4th and will run through January 9th. For more information about auditions, tickets and other events at TheatreWorks New Milford, visit their web site at www.theatreworks.us.